Yes! The secret is out! Welcome gals to the unveiling of my new Blog and Web Site! I just want to shout Hooray and Yippee!! This has been a work in progress for a long time…..and now it is here! Wooooo Hooooo! I hope you agree that my son Dusty did an amazing job! I knew from the time He was a little man that God blessed him with the gift of creativity! I gave my dear friend Cat from The Vintage Housewife a sneak peek and she said it was like “Disneyland for Mama’s” I love that!! She also said “Dusty Rocks!”. I couldn’t agree more! I can’t wait for y’all to come on in and take a look around! I have a page titled Blue Ribbon Product Reviews where I will be sharing, via video, some of my favorite products that have blessed my heart and home. Please keep in mind I am just a regular mom talking to you as if you stopped by, my dear sista, for a piece of pie and a cup of tea…….I am certainly not a seasoned professional in front of the camera, it’s just little ol’ me chatting about things I love so much I want to marry’em! You will notice that the Banner says, Aunt Ruthie’s Sugar Pie Farmhouse….my blog page is still Warm Pie, Happy Home (which includes all of my archives), but it is now under the umbrella of Aunt Ruthie’s Sugar Pie Farmhouse. I added the name Aunt Ruthie…because it sounds old fashioned and homey, it also has a warm and welcoming ring to it…and that is how I want you to feel when you come to visit me at my farmhouse, like we are all part of one big happy family! I also love the name Sugar Pie…besides the fact that I love to make pie, my hope is that you’ll find lots of heartwarming ideas that will help you make your home as sweet as Sugar Pie! And y’all know that “Farmhouse” is my style…down-home, comfy, homey and cozy. And since I live in the Ozarks, on an old cattle farm, it just seemed to make sense! Aunt Ruthie’s Sugar Pie Farmhouse is just at the beginning stages…in the coming weeks and months we will be adding more recipes, new categories, home decor, Christian Inspiration, and many more ideas that I hope will encourage you in your adventures in homemaking! We just wanted to get this baby up and running! Now for the Sugar Pie Sisterhood giveaway!! If you sign up to be one of the Sugar Pie Sisters you will be entered into a drawing to win five fabulous prizes!! By joining you be “in the know” about new product reviews, Aunt Ruthie’s give-aways, recipes, special announcements and any of her “sweet-as-sugar pie” offers! It’s free y’all! Come on, be my sista! The last day to sign-up for the give away will be April 8, 2009. 1. 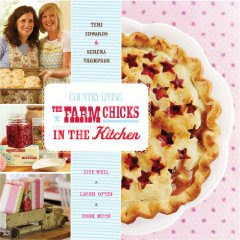 The Farm Chicks In The Kitchen Book! If you look up the word adorable in the dictionary I’m pretty sure you’ll find a picture of The Farm Chicks book! Every turn of the page is a delight to the eyes! Not only does it have recipes such as Cherry Breakfast Swirl, Butterscotch Pie, and Enchilada Soup, but there are darling storage tips and decorating ideas that will inspire you to doll up your home! Teri and Serena also share their fascinating life stories. They are just the sweetest farm-gals ever! Included in the book you also receive a free one year subscription to Country Living magazine! Look at how cute the Farm Chicks book looks in my kitchen! 2. 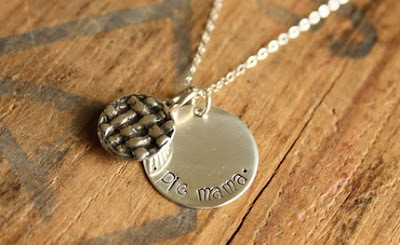 A Sterling Silver “Pie Mama” necklace and pie charm! How adorable is this!! It is handmade by a sweet Texas gal named Jennifer from Her Southern Charm!. (Check out her etsy shop click here! Jennifer even makes custom necklaces…each one unique and charming! If you don’t win today’s giveaway but would love a Pie Mama necklace (designed exclusively for Warm Pie, Happy Home) then click here! Thank you Jennifer for designing such a dear-to-my-heart necklace and for providing it for my give-away! 3. 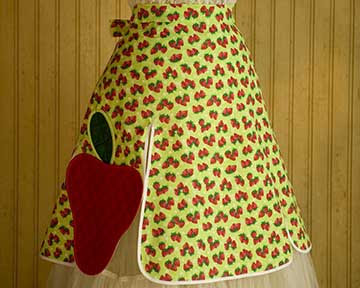 An honest-to-goodness Mary Janes Farm apron! You just gotta love that Mary Jane! Here’s Miss Mary Jane looking so daisy-fresh and summer-sweet! 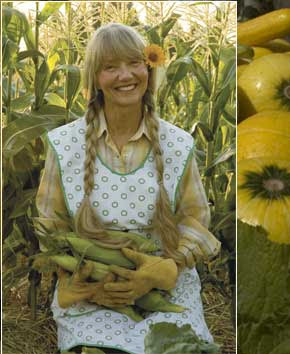 If you are new to Mary Janes Farm, she has a lot to teach us about the farm-girl life! 4. A set of Mother Hen measuring spoons! A must have in every Farmhouse! I love to prepare meals and bake with pretty utensils and bowls…it just adds a little joy and a dash of delight to the whole experience! There you have it girls! I would soooooo love it if you would tell all your friends about my new home-place, the give-away and the Sugar Pie Sisterhood! (if you would like to grab a picture from this post to share with other gals feel free!) Remember the last day to sign up for the give-away is April 8, 2009. I also would love to hear from you! Please leave a comment and let me know how y’all like Aunt Ruthie’s Sugar Pie Farmhouse! What an adorable new home you have! Your blog has always inspired me (and I must say, I baked my first ever pie not too long ago because yours looked so delicious) and I’m looking forward to seeing what you have in store for us! Love your blog….how refreshing! I am now a sista! The giveaway looks amazing……hope I win! Love the new site. Your are so inspritional. Keep up the great work. I would really LOVE, LOVE, LOVE, to win those goodies. And like you say, “I want to marry them.” LOL. Thank you. Your new look is fabulous darling….just fabulous! I made your Hillbilly Spaghetti Pie and the family just loved it! Received my first “sisterhood” newsletter today. Just like you stopped in for coffee it was so chatty. I loved it! I’m off to Target to look for some RED top glass jars. Thanks to your review. I’ll think of you each time I see them sitting on my kitchen counter. Love, Love, Love it! Love the new name too…and the new newsletter is so inspiring. I have often wished that I could just step through the internet and visit and this is certainly the next best thing! I love it! It’s awesome! You and your son did a wonderful job. I really enjoy coming to visit…shared about it on my blog too. Thanks for a wonderful giveaway too. Oh my goodness gracious! You have certainly outdone yourself missie – and what a wonderfully talented son you have. Creativity is obviously something else you’ve gifted your children with. Now, I must confess, I’m more than a little curious….about your spring decor. You always have such inspiring ideas and beautiful photos for the holidays, perhaps we could get a peek or two. Pretty please with extra sugar on top? Hi Ruthie. I absolutely love your blog. I just found it yesterday. I love all the great info but especially the music. You are so cute! Great job! Love the new site, told all my friends about it on facebook and now they are all raving about it to their friends! Oh good grief – this will teach me to not stay away long ever again. First and foremost, I LOVE your site!! It feels like home. This is an amazing website and I know you must be so very proud of Dusty. Wow!! I just want to sit down and soak it all in. Congratulations on such a beautiful new home. And thank you for inviting all of us in. Congratulations on your new site! Very neat…Hope you’ll come by and visit my new blog and give-away. Really, Really love your site. So positive & fun! A great way to unwind after a long day of work. I just wanted to let you know that I love your blog. I just discovered it a couple of days ago and am trying to catch up on previous posts. It is wonderful and your son has done a great job with all of the “technical stuff”. I look forward to checking in as often as possible—it is such a fun site!!! Very sweet blog! I look forward to more reading more good stuff! Oh, I just love your new site! Thanks for giving all of us some encouragement! I am not sure if I already asked to be entered in your giveaway, however, I love all the wonderful treasures! I also received the first newsletter, and I loved it! You make homekeeping seem fun and rewarding, which it should be. My FAVORITE website and blog! I am in LOVE with your design, your inspiration and your passion! I subscribed to your newsletter and am following you in Reader as well! CONGRATS on your accomplishments. The retro feel makes me feel all safe and homey. I love your music selection as well. How does one go about getting your playlist(s)? I want to have this playing in my kitchen to get me in the same mood as I am when sit down to visit at your farmhouse! Can’t wait to see what you think of next! Please count me in for your giveaway! Did you pick the BIG winner yet? I feel like I have just had a wonderful visit with my momma, grandmomma and all the aunts! 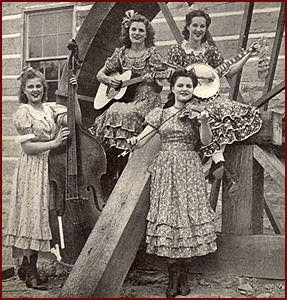 They were all great country cooks and could whip up a farmhouse feast in no time flat. Ruthie I have not stopped by in awhile and so today when I was blessed enough to have some mommy time I remembered one of my favorite blogs. Boy was I in for such a wonderful surprise! Love the new look!!! You are such an inspiration! I hope to be able to stop by more often. If you’re in the corner and have got no money to go out from that, you would require to receive the credit loans. Because it will aid you emphatically. I take consolidation loans every time I need and feel myself good because of this. Where can I find measuring spoons like the ones in the photo?